If you have been seriously injured due to the negligence or carelessness of someone else, our hearts go out to you. We hope that you will have a quick recovery and be back on your feet in no time. However, you probably have costs and expenses related to those injuries. You may have had to miss time from work, or have recurring nightmares or anxiety about what happened to you. In the worst case scenario, you may have even suffered the death of a beloved family member. At The Hart Law Firm, P.A., we are building a team of caring and experienced Cary personal injury lawyers who are eager to fight for the rights of our clients. Unfortunately, the insurance industry is driven by corporate profits and not the interests of personal injury claimants, and they will fight you tooth and nail to keep you from recovering the financial compensation you are rightfully entitled to after a serious accident. Our lives can change in the blink of an eye, and when they do, as personal injury lawyers, we are here to help. Our goal is to help you recover the justice you so rightfully deserve and obtain enough financial compensation so that you and your family can move on with your normal daily lives. We can’t always fix the physical injuries you suffered, but we will fight like hell to make sure you are compensated appropriately for those injuries. Our team of Cary personal injury attorneys at The Hart Law Firm, P.A. is well-suited to meet your needs. This all starts with a quick phone call to our office, where we will connect you with an available attorney, followed by an in person meeting. If you are too sick or your injuries too severe to come to us, we will come to your home or even the hospital to meet with you and provide an free and honest appraisal of your situation. Our goal is to provide you with lots of information and answer all of your pressing questions about the various aspects of personal injury law and how you should go about initiating a claim with the insurance company. When you call our injury law firm – no matter the time – you will immediately speak with a caring and knowledgeable staffer who will connect you with a personal injury attorney in our Cary, North Carolina offices. You initial, free consultation is an in-person meeting with one of our dedicated Cary injury lawyers, that will happen very quickly after your first contact with our office. All of our cases are handled on a contingency fee basis, which means that you will pay us nothing unless we are able to recover financial compensation for you. If you have already negotiated a partial settlement with the insurance company, but you would like for us to review it for you, we are happy to do that too. In those situations, we would only take a fee off the additional amount we are able to recover for you, not the settlement amount you had previously negotiated. We believe very strongly that a client that is armed with information is a more successful client. For that reason, you will find a wealth of information on this page and throughout this website. Below we have included a brief overview of personal injury law in North Carolina. This should only take you a few minutes to review, but it is well worth your time to begin to familiarize yourself with the personal injury process. The more you understand the basics of personal injury law, the more knowledgeable you will be when it comes time to choose a lawyer to represent your interests. Even though our offices are in Cary, North Carolina, we represent clients in Raleigh and Wake County, as well as the Triangle region and throughout the state. Why Seek Out an Experienced Cary Personal Injury Lawyer? Personal injury is a legal term relating to an injury to someone’s body. The most common example of a personal injury is someone that has been injured in a car accident, but that is just one type of personal injury. Personal injury law also includes situations where a doctor may have misdiagnosed a disease or injury that you have suffered, or even slip and fall cases in the grocery store. If you have a loved one in a nursing home that has been neglected or abused by the nursing home staff that can also be considered a personal injury. The one common denominator for all of these cases is that someone is injured because a person or organization failed to adhere to the appropriate standard of care for the at-fault party. Another example of a personal injury case is when someone uses a product that is defective and thus unsafe – and the use of that product results in an injury. Personal injury can also include sexual abuse cases or situations where someone suffered a heart attack in a public place. There’s virtually no limit to the various ways in which a person can be injured. Many of these cases can get extremely complicated and involve multiple defendants. In the most tragic of cases, the injuries suffered may cause the death of a loved one which can lead to a wrongful death claim. An experienced Cary personal injury lawyer will be able to help you navigate the insurance claims process and determine an appropriate legal strategy in the event you choose to pursue a legal action in the court system. What Damages Can You Recover After an Accident? If you have been injured, you must understand the following four elements that are present if every claim for personal injuries, regardless of whether it is an auto accident case or a nursing home abuse case. Duty – Someone must have had a duty to act in a certain way. This is considered the “standard of care”. In many situations, the standard is to act as an ordinarily reasonable person would in that situation. One example is that everyone has a duty to operate their motor vehicle safely on the streets and highways. In other situations, the duty may vary. Certain professionals or individuals will have different levels of responsibility given their role in causing the injury. Breach – The person or organization that injured you must have breached their duty. This could happen if someone rear-ended you or ran a red light and hit your car. In these situations, the person who was “at-fault” would have breached their duty. Causation – As a result of the breach of their duty, the person or entity caused something bad to happen, such as two car accident. Basically, but for the fact that the at-fault party breached their duty, no accident would have occurred. Harm or Damages — Someone must have been injured as a result of the actions of the defendant. As a result of their injuries, the injured party it legally entitled to damages, or financial compensation. There are many types of damages, which your Cary injury lawyer can explain to you. However, damages typically fall into two basic categories: (1) actual or “special” damages which compensate you for your out of pocket losses; and (2) general damages, which represent additional monies levied against a defendant for your pain an suffering. In North Carolina, the statute of limitations is three years for most personal injury claims. This means that you must file a lawsuit to recover your personal injury damages within three years of the incident giving rise to the claim. 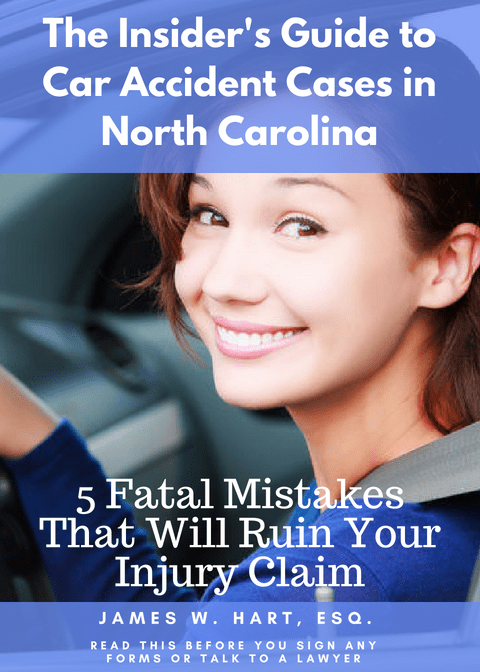 If you fail to do so, you will lose the right to pursue your claim in the North Carolina Court System. There are some exceptions to this rule, such as if the Plaintiff is a minor child, or if you and the insurance company consent to participate in mediation. If you have read through this entire page, you are probably starting to have a lot of questions. Honestly, this stuff is confusing and it doesn’t make sense for you to take on the insurance company by yourself. An experienced Cary personal injury lawyer can take your hand and walk you through the personal injury claims process to help you understand the process, and alleviate any fears or concerns you may have about what is coming next. The insurance adjusters you will come into contact with are highly trained and skilled at keeping settlements low and resolving cases quickly. You should understand that many claimants who do not retain counsel will run a significant risk of not only compromising their claims (unintentionally, by the way), but recovering significantly less compensation those who hire a lawyer for assistance. Most personal injury defendants have some sort of insurance in place to protect their financial interests, and those insurance policies will pay a lawyer to represent them. But before you even get to the defense lawyer, you will be talking to an insurance adjuster who is highly skilled and trained to offer the least amount money possible to get your claim to go away. Without a lawyer on your side, how can you possibly know what to do? If you were to accept their initial, low-ball offer, you will be asked to sign a release that will preclude you from seeking additional compensation later on. Many unwitting claimants do just that and seek out the short term financial compensation without properly looking at the big picture and their future needs. Another huge advantage to hiring a personal injury lawyer is that you will no longer have to take the calls and letters from the insurance company trying to talk you into settling your case for the bare minimum. One you retain a lawyer, we will make it our job to take all of those calls on your behalf and you will never need to deal with them again. Instead, you can focus on your recovery and getting your life back to normal. A personal injury law firm also knows how to effectively investigate and prepare an accident and injury claim in the event you must file a lawsuit. Every case we take in we assume will one day end up in front of a jury. By taking this mindset, we are able to looked constructively at the facts of your case, and begin to procure evidence that will help to tell your story in court. Our investigation may uncover evidence you would have never even thought to look for. In addition, we may retain expensive expert witnesses whose testimony will be necessary to bolster our case in front of a jury and prove each and every legal element of your claim. Once you have finished your medical treatment, and we have completed our investigation of your claim, we can use the information and evidence we have gathered to negotiate a fair settlement of your case. It is our sincere hope that the information provided on this page and helped you to understand some of the nuances of personal injury law in North Carolina. We also hope that it will help you to make more informed decisions about your case. There is almost no situation where it does not make sense for someone who has suffered an injury to speak to an experienced personal injury lawyer to get their questions answered. For a free initial consultation and assessment of your case, you may call the personal injury lawyers at The Hart Law Firm, P.A. at (919) 887-8582.